From the village of Tra Que, vegetables of many kinds have been provided for restaurants, hotels, Hoi An's people as well as for other localities in Quang Nam Province and Da Nang City. Many kinds of organic and sweet smelling herbs have been planting in this area for ages. Tra Que raw vegetables have been added up to make aromatic flavour to specialties of this village such as Tam Huu, Banh Xeo, Quang Noodle, vegetable cooked with garlic and so on. Specially, the vegetable village has seveval herbs containing medicine that is good for health and made up orental medicines (also called Vietnamese Traditional Medicines). 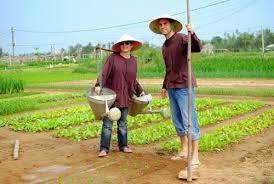 Coming to Tra Que Vegetable Village, you will perceive cultural cachet of the traditional village. 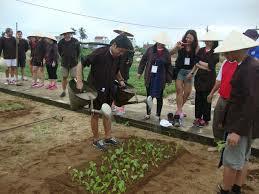 You will see the landscape of the green, clean and picturesque vegetable village with your own eyes. Together with the local farmers, you can exchange, investigate the techniques of cultivation, care and harvest of vegetable. Your feet will be looked after by traditional madical methods (your feet are soaked in a basin with boiled water cooked with some kinds of medicinal herbs gathered from gardens). Combining with foot massage, your feet will be treated for tiredness after having spent time travelling for a long time. 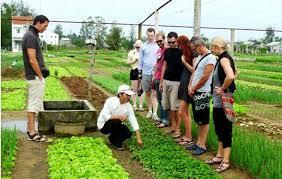 We believe that after the tour tour Tra Que Vegetable Village, you will feel buoyant and cheery and enjoy the real life of the local people of this place. This day-long excursion combines a bicycle tour of coconut palm fringed villagers, a coracle tour of the waterways, with a unique opportunity to learn about the cultivation of organic produce alongside one of the local farmers. 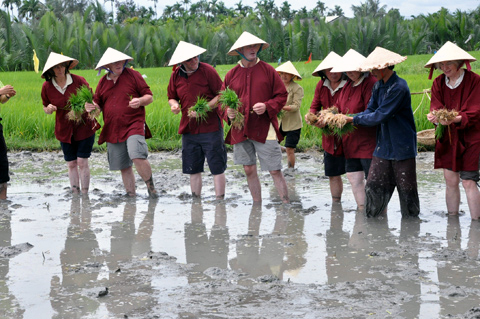 A great way to experience rural Vietnam and bring home a small part of it with your new cultivating and cooking skills. 09.00 Your guide will meet you at your hotel, from here your gentle cycle tour takes you on the short but beautiful ride through lush farm land, rice fields and small villages to Tra Que Village. Stopping along the way to visit local villagers and seeing how they use their surrounding resources to craft a living using age old methods. 10.00 Take a trip along the winding river by Coracle boat. A local family and guide will take you on a journey through the untouched waterways, fringed by river coconut palms. Take the opportunity to see a local fisherman dredge the river bed in search of river snails. 11.00 Arrive at Tra Que. Enjoy the village tour to nurseries and herb gardens abundant with bird’s eye chilli, lemongrass, basil, coriander and spring onions. All thriving in the rich soil. 12.45 Join in with a cookery class hosted by the Tuan family. Each cooking lesson starts with a short introduction, explanations and demonstration of starters, accompaniments, main course and dessert, before you get to roll up your sleeves and try your hand at preparing your own Hoi An specality lunch including starter, main course and dessert. Sit back and enjoy your culinary creations at the family table overlooking the villagers tending their arable land. 16.00 Arrive back at your hotel in Hoi An. THE TRIP INCLUSIONS: Transportation, English speaking guide, Coracle boat, Lunch, Mineral water & Wet tissues, Entrance fees. THE TRIP EXCLUSIONS: Personal expenses, Tips, VAT tax, Travel insurance.